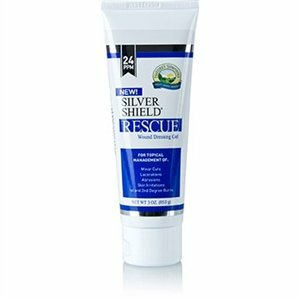 Silver Shield Rescue Gel Rescue Gel is for use in moist wound care management. Apply to minor cuts, lacerations, abrasions, skin irritations and first- and second-degree burns to help inhibit the growth of microoganisms within the dressing. It may help inhibit the growth of microorganisms within the dressing. Ideal for the topical management of minor cuts, lacerations, abrasions, skin irritations and 1st and 2nd degree burns. Silver Shield Rescue is manufactured with a patented process using Bioavailable Aqua Sol Technology, which utilizes only fine particle-sized silver to optimize bioavailability and efficiency. Silver Shield Rescue provides 24 ppm of bioavailable silver. 24 ppm proprietary silver solution (purified water, nano-silver at .01 micron).